Well, I’m talking about politics today. They say there are two things you should never discuss in polite company – religion and politics. They stir up too much controversy. And here I am doing both at one time! My desire in this, of course, is not to cause conflict, but to help us get focused on who we are as Christians in the midst of this highly charged political environment, and to encourage us to think and act in ways that are in line with our Christian identity. I had wanted to share with you before the political conventions, but decided to wait – although with everyone all fired up now, I hope that you will still be able to hear what I want to share with you this morning. 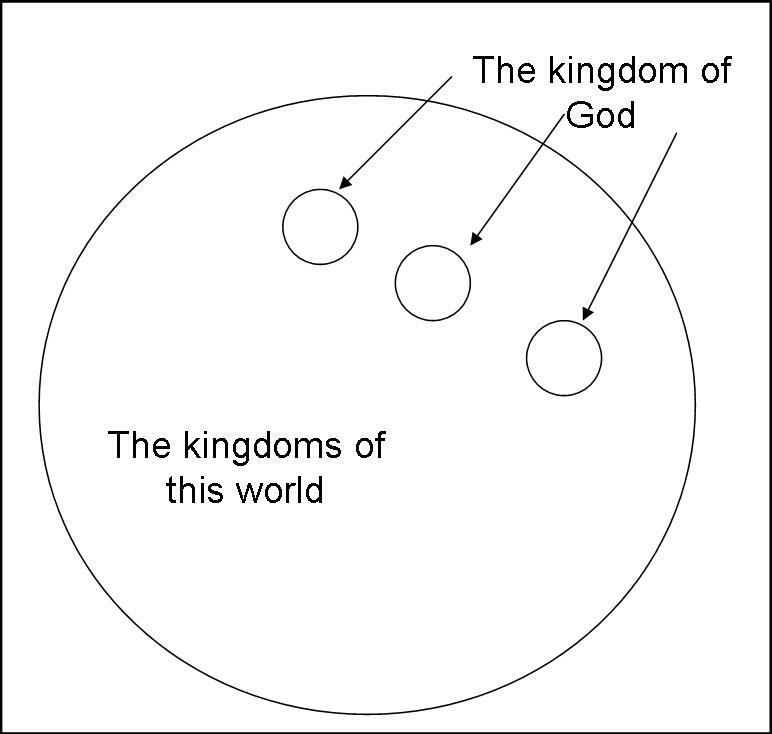 “the kingdom of this world” – (Revelation 11:15) encompassing all the nations of this world. Jesus is the ruler of the kingdom of God; Satan is the ruler of the kingdom of this world – John 12:31. The kingdom of God will never end; the kingdom of this world will end – Daniel 2:44. As this text says, the kingdom of God will bring all earthly kingdoms to an end. The kingdom of God is about humbly serving others in love; the kingdom of this world is about power – Mark 10:42-44. Certainly at national election time, you do what it takes, or what you can get away with – slander, distortion, manipulation – to gain and then keep power for yourself. Lets look at this passage in Mark 10:42-44 – “You know that those who are considered rulers of the Gentiles lord it over them, and their great ones exercise authority over them. But it shall not be so among you. But whoever would be great among you must be your servant, and whoever would be first among you must be slave of all.” Jesus is saying, this is how it is in the world; its about power, rule and authority. But it is to be different in my kingdom community; its about humble service to others. So we can see that, these two kingdoms are fundamentally different from each other; different rulers, different destinies and different ways of acting. That’s why Jesus says, “My kingdom is not of this world” – John 18:36. Its of a different order. 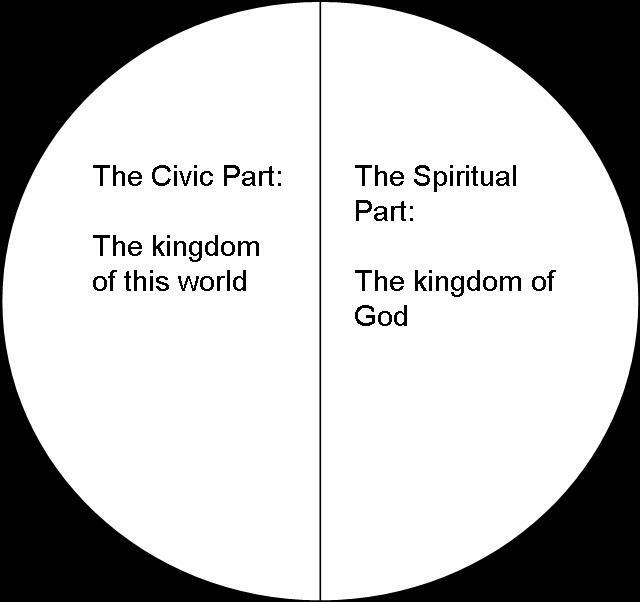 Now sometimes we think these two kingdoms fit together like this: There is one nation, with the kingdom of God as the spiritual half, and with the civic part – the kingdom of this world – as the other half: two halves of a whole. But this doesn’t do justice to the differences we see in the two kingdoms and Jesus’ statement – “My kingdom is not of this world.” Instead of two halves of a whole, what I want to say is that there are actually two complete wholes: two distinct nations, two societies or political realms – the kingdom of God and all the nations that make up the kingdom of this world. Both are complete wholes in and of themselves. Just as the world and each nation in the world has leaders, so the church has leaders. Just as the world has those that care for the needy, so the church has Deacons. Just as the nations collect taxes, the church has freewill offerings. Just as the nations have criminal justice systems, so the church is to have a loving system of admonition and discipline. Who are we? Citizens of the kingdom of God or in the words of Paul, “our citizenship is in heaven” – Philippians 3:20. What are we? A new “holy nation” as Peter says in I Peter 2:9, speaking of the church. We are a Christian nation. And lets be clear, the church is the only Christian nation there is, or ever has been, or ever could be. No nation in the kingdom of this world can claim this. And this nation, is international in character. It is made up of people “from every nation, from all tribes and peoples and languages” who have all come together and united under Jesus, their Lord (Revelation 7:9). Where are we? For now we are living in the midst of other nations – in the kingdom of this world. – We are ‘in the world but not of it’ – John 17. We live in and amongst the kingdom of this world, but we are not of the wordly kingdom, we are submitted to Jesus as our king. – We are “exiles” in our various nations – I Peter 1:1. The people of God “are strangers and exiles on the earth . . . seeking a homeland. . ..They desire a better country, that is, a heavenly one.” (Hebrews 11:13-16). We are waiting for Jesus to return and to establish his kingdom community over the whole earth. So this is our political identity. I think that today we easily lose sight of this and allow worldly political identities to creep in and take over. Instead of seeing ourselves as citizens of God’s kingdom here on earth, in exile amidst the kingdom of this world and its nations, we begin to see ourselves as Democrats or Republicans or Independents – simply as a part of the kingdom of this world. And this leads me to the next point . . .
Now, some of us, out of Christian conviction, don’t vote. We feel that voting goes beyond what Jesus has commissioned us to do, and that it easily gets us off track from the mission he has given to us. Some of us, out of Christian conviction, do vote. We feel we can help to do some good with it. You can make your choice. What I’m saying is, if you do participate, recognize this: There is no party or candidate that fully represents Jesus and the values of the kingdom of God, which is our nation. Yet these are all kingdom values, my friends. But we have to choose between them when we vote. So, some will choose one way and some another. And a part of this has to do with whether we think they will actually do what they say on a given issue. Or, are we being manipulated? Also it has to do with whether we think a single issue trumps all others, or whether we take several together and vote based on these. And so there will be much disagreement, as Christians are honestly trying to use their faith to guide them – and yet coming to different conclusions. Can you imagine that? Christians coming to different conclusions on things?? So I say beware of partisan politics, which says there is only one right answer and it is obvious, and everyone else is an ignoramus. What I’m saying is . . .
Don’t get so wound up in it that you start dividing people up by whether they agree with you or not on your worldly politics, on how you have sorted this out. Don’t get so wound up in it that you bring strife and discord into the church as people make different decisions. Jesus call us to “be at peace with one another” – Mark 9:50. We can disagree, but we must be at peace with each other. This situation is like a professional baseball team preparing for the world series, who can’t get focused on their job, because they are arguing about which local little league team is the best. Here we are trying to establish God’s kingdom on this earth and we become divided by the politics of the kingdom of this world, which is passing away. We also need to beware of partisan politics because it can be a stumbling block for others. Don’t’ get so wound up in it that an unbeliever, who doesn’t share your worldly politics, can’t hear you speak God’s word into their lives because you are so busy speaking the words of a particular political party. Jesus warns us against causing others to stumble – Mark 9:42. Don’t let partisan politics cause someone to turn away from the gospel, because they aren’t first willing to accept your worldly politics. So what I am saying is that if you choose to be involved in the political process, do so in a way that doesn’t bring harm to the church or the cause of Jesus. Set aside partisanship, and simply vote as you think best, based on your Christian values (not just your self-interest) and make your choice with humility, knowing others will make different choices.
. . . or princesses for that matter. As Psalm 146:3 says, “Put not your trust in princes, in a son of man, in whom there is no salvation.” Politicians will promise you the world. They, and they alone, will save the day. But as our text tells us, don’t look to them to solve the ultimate problems of the world. And God has chosen us, his lowly church to continue Jesus’ work, not politicians. God does indeed work through rulers to hold things together for now as they suppress evil and bring order. And we are to submit to them (Romans 13). But God works through Jesus and his people to fix the world; to bring about God’s redemption and new creation. So put your trust in God, and let God work through you as a Christian to do his work of salvation in this world. Which brings me to the final point, as a church . . . These are things that flow directly out of our faith and bring us together. I think that we can all agree that, although Jesus never gave us a commission to reform the world through the power of the flesh, he does tells us “to love our neighbor as ourselves” – Mark 12:31. So we are not just supposed to withdraw into a corner without concern for the people of this world and their needs. Even as exiles on this earth, spread out among all the different nations of the world, not quite fitting in – we can still act in distinctively Christian ways to impact society around us. I will give you some examples, but I will have to be brief here . . .
We teach people to live according to the way of Jesus, our ruler, and to be a part of our nation – so that they not only are not a problem in society, but they become a benefit to the broader community. 2. We work for the common good of the nation we live in. We work to help with the problems of society; we get involved in grassroots ways to help people out. Jeremiah 29:7 says, “Seek the welfare of the city where I have sent you into exile.” This is also true for us today as God’s people in exile. Work with the poor, the homeless, pregnant teens, special needs children. Act as Christians; act out of love to help those in need in the broader community. And by doing so we make a difference in broader society. We ask God to have mercy on the United States – and this could certainly include that God will act in an election to establish a government of his choosing and one that would be good for this country. And if we believe in prayer, we know that prayer is what makes the difference. And then finally, whether you vote or not . . .
4. We can speak out on issues of righteousness to rulers, not as a Republican or a Democrat, but as God’s representatives. They are to remember the weak and the oppressed – Psalm 82. They are to forsake excessive violence in their use of the sword – Amos 1:3-5; 13. They are not to oppress their neighbor states – Amos 1:6-8. We speak out these and other things as God prompts us and as events demand it.